After a long drought, Cynthia's isolated honey farm has suffered in the heat. Soil dries into sand; honeycomb stiffens into wax. But she has a plan: offer the farm as an artists' colony with free board and -life experience' in exchange for a summer of hard labour. For Silvia, a recent graduate and would-be poet, the chance to test her independence proves irresistible – as does Ibrahim, a passionate painter she meets there. 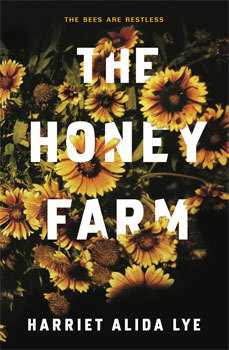 But the honey farm isn't all it seems. The idyllic summer is soon plagued by ominous events: taps run red, scalps itch with lice, frogs swarm the pond. The constant drone of bees begins to build like thunder in the air. One by one the other residents leave, until only Silvia and Ibrahim remain – perilously in love under Cynthia's watchful eye. And as summer shifts into autumn, Silvia becomes increasingly paranoid that they are in danger. What are the shadowy secrets that Cynthia is hiding? And if Silvia and Ibrahim have overstayed their welcome, what happens when they want to leave? Harriet Alida Lye is a writer from Richmond Hill, Ontario. She studied Philosophy and English at the University of King's College and lived in Paris for the better part of eight years, where she worked as a bookseller at Shakespeare & Company, an English teacher for the children of Jacques Lacan and Julia Kristeva, a storytelling researcher for Google, a painter's model, and various other jobs that kept her from completely starving as an artist. She founded and edited Her Royal Majesty, a literary arts magazine that ran for six years and published James Franco, Robert Hass, and the first-ever short story by Alice Munro. Her fiction, essays and reporting have been published by VICE, Hazlitt, Happy Reader, The Guardian, The National Post, and more. Harriet now lives in Toronto, and works at the McMichael Canadian Art Collection.